Where does Barstows’ milk go? Barstow’s Longview Farm produces about 20,000 lbs of milk – or 2,325 gallons – every day. That’s a lot of milk! But where does it all go? The Barstow Farm does not have a milk processing plant. There is too much milk for us to process all by ourselves and having bottled milk would add a whole additional marketing aspect that we simply don’t have the staff or time to deal with. There are also two nearby farmers that process milk and do a superb job – Mapleline Farm and McCray Farm. Why would we jump into the bottled milk business when our neighbors are already offering such great product! Support your neighbors, support your farmers! Barstow’s Longview Farm is part of a dairy cooperative. A dairy cooperative is a business, which is owned and controlled by the dairy farmers who produce the milk used by the cooperative. The cooperative we are a part of is called Agri-Mark, Inc. They use our milk and the milk from other local farms to manufacture cheese, dairy ingredients, butter, and other dairy products. They produce products for brands we know and love like Cabot– but also non-brand liquid milk, sour cream, cottage cheese, butter – dairy products you’d find in your local grocery store. 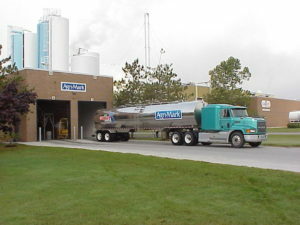 The milk at Barstow’s Longview Farm is picked up by Agri-Mark every other day by a refrigerated tank truck. The truck contains milk from other farms in the tank as well because most farms, like us, do not produce enough milk to fill the tank. The truck then heads to the Agri-Mark processing plant closest to our farm in West Springfield, MA. Because milk is so perishable, it does not travel very far. Usually, in New England, it takes three days or less to go from farm to grocery store. So while our milk may not be for sale in the fridge at Barstow’s Dairy Store and Bakery – you might be enjoying our milk without even realizing it! You could find our milk in Cabot butter, non-brand butter, non-brand milk, or non-brand skim, to name a few. And at Barstow’s, you can enjoy a local pint of McCray Farm milk, family owned, milked, and processed, and supporting not just them, but us too! The neat thing about dairy is that when you enjoy a grilled cheese or a tall glass of milk, you are supporting all dairy farmers, not just one.